As we celebrate and honor our veterans, the question that should be asked is what are we doing each and every day to help those who have served so valiantly to protect our country and our freedoms. I recall a letter I received from an elderly veteran, Republican, who is living in poverty with his wife. He is so concerned his social security and Medicare benefits will be cut. The suicide rate amongst our veterans is staggering. Every 65 minutes a loved and cherished veteran takes his or her life. 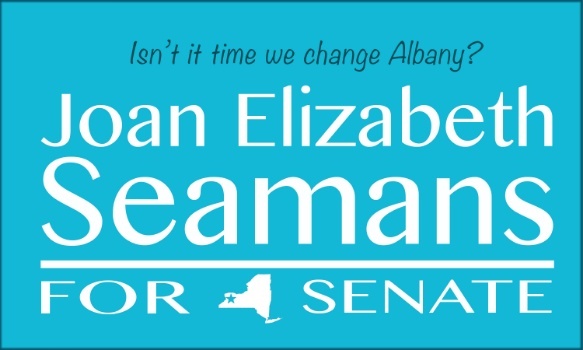 While veteran’s affairs remain primarily a federal issue, on the statewide level, I hope the new Democrat controlled NYS senate will be able to work with Republicans to find resources to help enhance programs that support our veterans. On a lighter note. This is my father WIlliam E Seamans Jr. He is a WWII Navy veteran. Although he is memory impaired, he still is proud that he is a veteran. I love helping him celebrate his service. Joan Elizabeth Seamans for New York.